Digium® and Incendonet Extend Asterisk® with Speech Recognition Solutions. Digium®, Inc., the Asterisk® Company, and Incendonet, Inc., a leading provider of speech recognition solutions for the enterprise, today announced that companies using Asterisk for their IP-PBX communications needs can now add speech recognition-based solutions in a plug and play manner to improve customer service, reduce operating costs and increase mobile worker productivity with Incendonet’s SpeechBridge®. Speech to Text Coming To iPhone? - Mobile Blog - InformationWeek. According to a patent filing, Apple is working on speech-to-text technology for its iPhone and iPod product lines. Speech recognition could be the holy grail for data entry and retrieval on mobile devices, especially as they continue to shrink in size. First the one that quit. I had signed up for Sprint's Voice Command ($5/month) for my Treo 700p over a month ago only to recently receive a letter saying that they are discontinuing this service as of July. Basically, you dialed "*" and then a prompt would come on. You then spoke the contact's name, but this wasn't using the contact manager on your phone (or at least on the Treo, I don't how other phones work). You had to go online to the Sprint Web site and enter these contacts into a contact database. I recall using their import function to pull the names off my phone, but this didn't work at all. Maybe that's why this service is being stopped. The Sprint Web site is working a lot better than it did not too long ago. Whenever you change your plan, they send you an SMS and an e-mail. If you have a question about your plan, you can chat with a rep online, and then the transcript of this conversation is sent to you via e-mail. And the one that I upgraded. I was also trying out the Voice Control based on Nuance technology ($6/month), but initially I didn't think that I'd keep it. On the Treo, after you install the software, the side button is reprogrammed so that when you hold it down, it launches the software and beeps to let you know it's ready. While still holding down the button, you speak the command according to the list they provided on the Nuance Web site. It sends the info to their services which then sends the text and commands back to the phone to do the task. The time it takes to do this is the big issue. I decided to finally review this product after getting the Sprint letter to see if I was going to discontinue both services. Voice Control prompted me to download the new version 1.5, which also made me download the new Palm installer before that. The upgrade was free and went on without a hitch, so I began my testing. The fastest function is a Google search, and it works remarkably well. I was able just to say "Search New York Cancer Consortium" while still on the dial pad screen, and in less than 10 seconds it brought up the Treo browser and some hits on Google. This particular search would have taken some effort with thumbtyping, so for searches like this one, it's a real convenience. Or, you can say "Find bookstore 10019," and it will give you a Google map of bookstores in Manhattan. Another real convenience. You can also create a small e-mail message, or add an appointment to your calendar, but this is only a convenience if you're on the go and can set the phone down or put it back in your pocket while it does its thing. It might take 20 seconds or more, or even sometimes not at all. I would like to have the ability just to make a quick note into the memo pad, but it won't allow this. As far as calling people in your phone's contact manager, it averages around 5-10 seconds, so if you're willing to accept this wait, it works well. Now that CTIA 2008 is underway, the stream of new product/service announcements is starting. Voicemail to Text, a voicemail transcription service that delivers high-quality readable messages to mobile devices. Offered through carriers, the service uses Nuance’s world-leading speech recognition and transcription workflow solutions to convert voicemails left on any voicemail box into text. Transcribed messages are sent to users as SMS or email messages. France Loisirs, the French version of a mini-Amazon.com, has now selected Atos Worldline to host and operate a new automated telephone order service, based on speech recognition. The service is named “Commande Flash” & both smooths out / combines the different purchasing channels already available and reduces human-handled calls. Looking at the healthcare sector, the Speech Recognition blog's Risking a SpeechMagic-Dragon Comparison? seems has started much discussion. Here's a photo of Sony's new digital voice recorders ICD-UX70 ($100), ICD-UX80 ($150) providing 1GB and 2GB in memory, respectively. Both support stereo MP3 recording, USB mass storage. 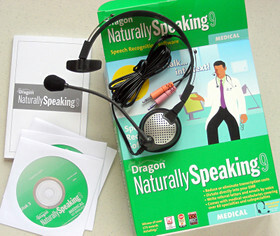 Their ICD-SX68 ($150) and ICD-SX68DR9 ($200) both have 512MB and support Dragon NaturallySpeaking speech recognition. The DR9 is bundled with the Dragon software. Finally, they're releasing the ICD-P620 ($60) and ICD-B600 ($40), both with 512MB and USB mass storage. 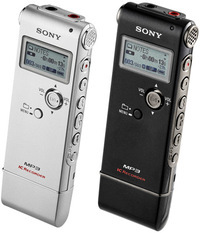 The P620 includes Digital Voice Editor software. This is part of their Wireless World special report. The particular story I want to talk about, "Killer Mobile Apps," is Handango's list of most downloaded software for smartphones. But I can't link to it because it's a slide show that comes up as a pop-up window. MobiTV - $10 per month to watch MSNBC, ABC, Discovery Channel, etc. 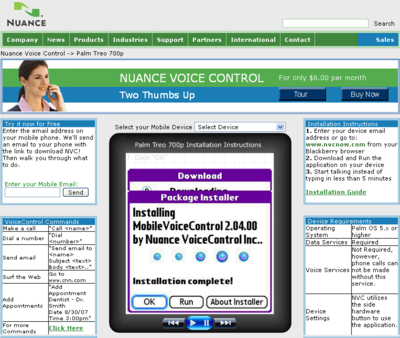 VoiceControl - Provided by Nuance Communications for $6 a month, the software enables users of devices based on the Palm OS to voice-dial, dictate e-mail and text messages, and view Web content without pressing a button. Ringtone Megaplex for BlackBerry - "Designed for Research In Motion's (RIMM) BlackBerry devices, this software offers more than 1,000 distinctive ringtones in genres from classical to pop." Microsoft Voice Command - From Microsoft for $39.99. This is another speech recognition application that makes it easier to use voice commands, this time to look up contacts, make phone calls, and choose music. UPDATE: I signed on for Sprint's Voice Command which will be billing me $5/month. I was able to set up the service through a rep chat service on the Sprint Web site. I then hit asterisk, dial, which started some voice instructions which said something about adding names to an address book on the Sprint Web site. Now, I'm told by another Sprint rep that this isn't necessary. You basically dial "*" and then are prompted for a name or number. It works for names in my address book, but I'll have to give it a thorough test to come to a final conclusion. I also downloaded Nuance's VoiceControl which is embedded speech recognition software for navigating through Palm OS allowing you to do a Web search or add an item in your address book. You hold down the side button on the Treo 700p, you hear a beep, then you dictate a command, then let go of the button. Phone Calls - Call [Contact's name] + [phone type (optional)]. Phone Dialing - "Dial" [phone number]. Call Voicemail - "Call Voicemail"
Quick E-mails - "E-mail" [Contact's name] Subject [subject text] Body [body text]. E-mail John Smith subject meeting body John, I'm going to be late to the meeting. Go ahead and start it without me. E-mail John Smith body Call me as soon as you get this. We need to talk. Calendar - "Add Appointment" [appointment text] Date [date of appointment] Time [time of appointment]. Add appointment dentist date January fifth time ten o'clock. Add appointment Joe's birthday date March second. Normally I don't watch the very theatrical videos on technology topics produced by NY Times tech columnist David Pogue, but this is a CNBC segment entitled "Digital Dictation" where's he interviewed in their studio by their anchorwoman, in addition to his Commedia dell'arte clip. See, the message was delivered without extras, costumes and special effects. Plus, I didn't get called out by the anchorwoman for calling her "Dude!" I'm continuing my exploration of the Dragon NaturallySpeaking (DNS) 9 Medical speech recognition software by going back to the KnowBrainer forum where I remember picking up a lot of useful information in the past. I was asking some questions I had about working through some things I needed to work out, and in the process I received some great tips from the folks there about how to use this software to its best advantage. 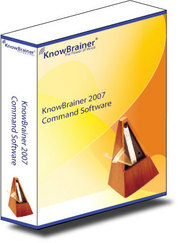 Based upon a strong recommendation for the KnowBrainer 2007 Command Set from a person on the forum, I decided to install it and see how it could improve my workflow. It basically adds 10,000 commands to DNS, tweaks some of the settings, provides their own Command Browser for creating advanced-scripting commands, and a scripting language called VerbalBasic to create commands verbally. When I first tried out Dragon's speech recognition software, the Pro version 9, the first thing that really amazed me was reading an article from the New York Times Sunday Magazine, and seeing how accurately it could transcribe a variety of words with very little training. Words like "kibbutz" for example, or even some proper names or acronyms. I think when most people try out this software at a computer convention or any other demo, they judge it by what they try to dictate ex temporaneously, which doesn't work as well. When you read something, it produces a flow and cadence that works better with the software. This makes you realize that you need to improve your dictation skills, both by pronouncing clearly and thinking far enough ahead so that you can speak a full sentence in a continuous flow, also including the punctuation where needed. 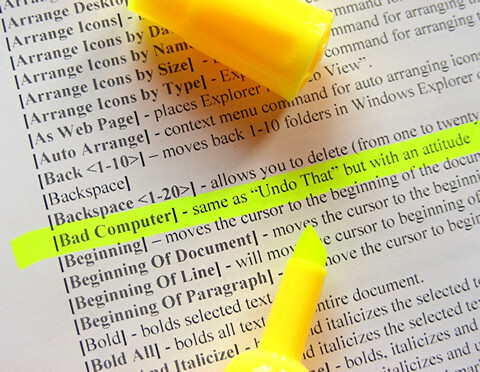 So, while you're still getting the hang of dictation, you find yourself trying to remember commands to select, edit or correct your mistakes by moving the cursor and making it do what you want it to do. Now things slow up. This is where the Command Set begins to show its usefulness. While DNS obviously comes with its own set of commands, some of which are available in the printed manual, all of which are searchable within the program, the list in the Command Set PDF manual gives you the full roster of the commands you can use. What I did was to print out the pages with the commands list, and just scan it for the commands that I've been needing, then trying them out. So far it's increased my speed in the using DNS. The second amazing thing is realizing that you can navigate through various Windows programs with spoken commands. It really improves on the tedious task of using the mouse and keyboard to pick through screen menus. And what's really impressive is opening documents without searching through the file folders. If you want to check something in the manual, you simply say "How do I," and the PDF opens. Supposedly it's also possible to search for any file on your PC using desktop search software which I'll be trying out next. I think anything that saves you from peering at the screen to navigate is a wonder. I'm not particular in love with typing either. Yesterday afternoon, as the snow continued to fall here in Brooklyn, the DHL delivery man brought me the latest medical speech recognition software from Nuance Communications, Dragon NaturallySpeaking 9 Medical. I'm not only interested in streamlining my workflow when writing on oncology and medical technology topics, but also speech-driven clinical documentation. This allows the physician to customize patient data in an EMR that pick lists won't allow. This story by Eric Fishman, MD of EMRConsultant.com, tells of his experience using templates for capturing data in an EMR versus using speech recognition. [Disclosure: He's a reseller for this software.] His point is that although much of the patient interview process is about clearly defined reponses to standard questions, eventually these patient records begin to look alike if you're limited to using pick lists. It does take some effort on the part of the person dictating in developing a good dictation technique. When I was a pathology resident, I gained an expertise in dictating observations as I did my dissections of specimens. These tapes were later given to a transcriptionist who typed out the reports. As far as producing a convincing story that explains a topic in an interesting way, some forethought is needed, but you still can expect to do some editing afterwards. If you don't, you wind up with a written piece that's a tad bit too chatty--you're caught up in a web of circumlocution, and the reader doesn't have a clear idea of the points you're making. Now for the unboxing. You can see in the photo that the package contains 3 CDs, a manual and a headset with a boom mike. Installation occurred without a hitch, and it was just a matter of plugging in the headset into the sound card of my PC with the headphone and mike jacks. It had me read a few paragraphs for the initial training. Then it scanned my Word docs and Outlook e-mail to get an insight into how I write. I wonder if they should give you the option of choosing which files to look at because some of my Word docs are culled from the Web, and my e-mail tends to be telegraphic with a few exceptions including the occasional angry rant at Apple for something iTunes screwed up again. Next, I was given the choice and reading a medical passage, ranging from easy to hard. I chose the hard just to get the most mileage from my spent doing this. It was a typical surgical procedure dictation. This is was about placing a cardiac catheter via a groin stick. I started the video training feature, but it sparked my memory of when I was using the regular version of Pro 9, so I skipped it and proceeded with testing its accuracy. In Burkitt's lymphoma, the c-myc oncogene is activated by translocation of genetic material from chromosome 8 to chromosome 14. Chronic myelogenous leukemia (CML) is defined by a reciprocal translocation of the long arms of chromosomes 9 and 22, resulting in the generation of a fusion protein (BCR-ABL) with tyrosine kinase activity. In Burkitt's lymphoma, the C. MIC on go gene is activated by translocation of genetic material from chromosome 8 to chromosome 14. Chronic myelogenous leukemia (CML) is defined by reciprocal translocation of the long arms of chromosomes and 9 and 22, resulting in the generation of the fusion protein (BCR-ABL) with tyrosine kinase activity. I picked this passage specifically for "c-myc oncogene" term. What I said was "see mick oncogene," which is the way I would pronounce it if I were giving a talk. From what I understand so far, I can produce a voice macro that will allow me say something like, "Charlie hyphen m-y-c oncogene" and it will produce this term with the proper italicization. Treatment of HER-2/neu-positive early-stage breast cancer with the combination of chemotherapy and the targeted agent trastuzumab has resulted in striking improvements in outcome so much so that finding this gene not only predicts response to treatment but also a lower risk of recurrence. Treatment of HER-2/neu positive early-stage breast cancer with the combination of chemotherapy and a targeted agent trastuzumab has resulted in striking improvements in outcome so much so that finding this gene not only predicts response to treatment but also a lower risk of recurrence. The next passage really impressed me considering the only error was a missed hyphen after "neu" which may really not be needed, and the lack of italicization. Getting "trastuzumab" correct shows the benefit of having a comprehensive medical vocabulary.